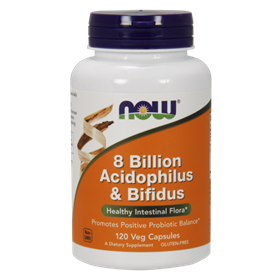 NOW Acidophilus 8 Billion provides high potencies and a balanced spectrum of beneficial bacteria found in human intestinal tracts. Regular intake of beneficial probiotics can aid in maintaining healthy intestinal flora. Probiotics are the friendly bacteria that are similar to other organisms that live in the digestive tract. Certain strains or types of probiotics have been linked to all sorts of health benefits, helping with irritable bowel syndrome, colitis, and the infamous traveler’s diarrhea, to boosting the immune system. They're often used when taking antibiotics to combat diarrhea that may result from taking antibiotics. Bifido bacteria are especially important for maintaining consistent bowel movements, keeping pathogens out of the blood stream and processing our waste. They manufacture B-vitamins and combat antibiotic side effects. Infants primarily have bifidobacterium in their colons and a lack of colonization from this bacteria can increase susceptibility to rotavirus, e coli. and other bacteria. Suggested Usage: As a dietary supplement, take 1 capsule 1 to 2 times daily between meals or on an empty stomach. Consider taking this product in combination with a NOW® fiber supplement, Nutra Flora™ FOS and Optimal digestive System. Other Ingredients: Potato Starch, Gelatin (capsule), Cellulose, Silica and Magnesium Stearate (vegetable source). Contains milk derivative. Provides 10 Billion microorganisms per capsule at a time of manufacture.